As the Green Seattle Partnership continues to restore Seattle’s forests, it is important to keep an eye on the local fauna gracing our parks. The Seattle Cooper’s Hawk Project, an annual volunteer-run survey, does just that. For the past fourteen years Seattle’s dedicated hawk-watchers have scoured the city for these nimble raptors’ nests, documenting a steadily rising population. 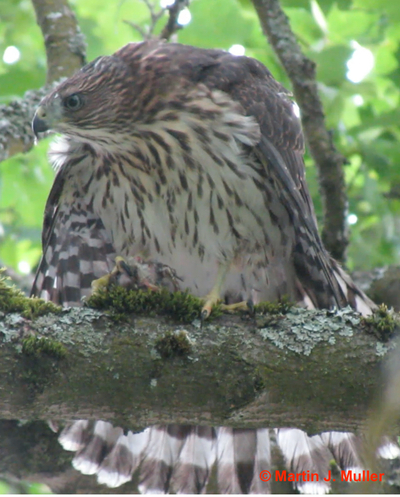 Why study Cooper’s Hawks over the many other feathered and furry friends of Seattle’s forest? 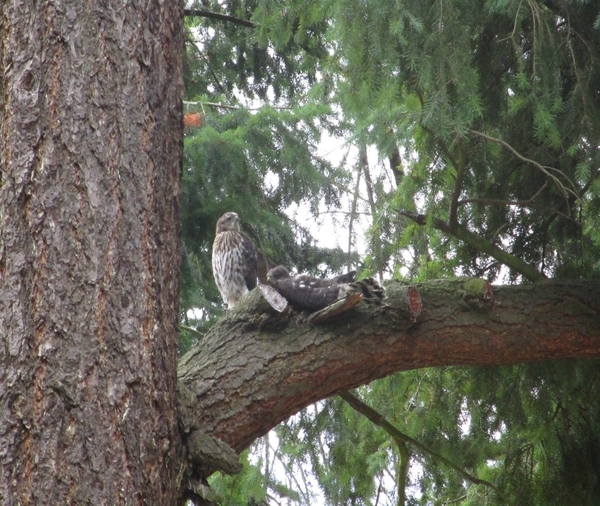 According to Ed Deal, leader of the Project, Cooper’s Hawks are uniquely adapting themselves to the urban environment. As the hawks develop tolerance to human activities they gain access to abundant sources of prey, including starlings, pigeons, and rats. Therefore, future shifts in Cooper’s Hawk behavior will be an important indicator of urban environmental health, especially in our unpredictably changing climate. The work of the Green Seattle Partnership cannot be fully credited for the Cooper’s Hawks’ success, but the city does take steps to ensure that its restoration efforts create good avian habitat and do not disturb existing nests. As an example restoration activities are phased to accommodate nesting patterns, and stewards are sure to steer clear of active nests. For more information, check out these reports on the avian impacts of habitat restoration and restoration planning for breeding birds. And see below for the report from Ed Deal himself. • We found 44 nest-building pairs, 42 incubating pairs, 39 nests with hatching, 38 pairs with fledged young, and a record high 140 fledglings. • The nesting density continues to increase every year. This year computing to one nest for every 1.91 square miles. • Of the 210 birds we color-banded over the last six years, 71 have been sighted since, an excellent return rate of 33.8%. • The most popular choice of nest tree was Big Leaf Maple (15), followed by White Pine (9), Douglas Fir (8), Madrona (3), Alder (3), Deodar Cedar (3), Norway Spruce (2), Blue Atlas Cedar (1), Cottonwood (1), Sycamore (1), Apache Pine (1), and Unknown (6). This includes several pairs that built multiple nests. • Most nest sites are located in parks and greenbelts owned by the City of Seattle (28), followed by private yards (15) and the UW (1). 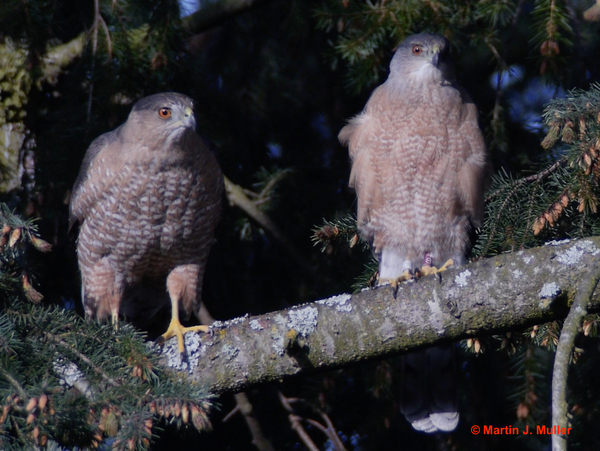 Apart from the survey, our team continues to study and spread the word about Cooper’s Hawks. Our paper on female mate choice in Cooper’s Hawks was published in the March 2017 issue of the peer-reviewed Journal of Raptor Research. Once the rainy season settles in, we will start work on other short articles. With the help of great photos from many people, plus several excellent videos by Martin Muller, I put together an hour-long presentation on Seattle’s Cooper’s Hawks. So far I have talked to the UW Wildlife Seminar, Falcon Research Group Raptor Census, WA Ornithological Society, and Vashon Audubon. On the Fall schedule are presentations for Tacoma Audubon and N. Cascades Audubon. Invitations are in the works to speak to Dungeness/Olympic Audubon and Eugene/Lane Co., OR Audubon. Finally, I was honored to be profiled in an article on Seattle’s Cooper’s Hawks in the Seattle web-based newspaper Crosscut.com. Thank you all for your interest, hospitality and sightings reports. Spring nesting surveys start in March 2018. See you then! ​Edward A. Deal, President and interim Treasurer of the Urban Raptor Conservancy, has been studying birds of prey for 25 years. 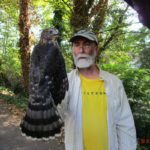 He holds a master banding permit with the USGS Bird Banding Laboratory and a scientific collection permit in Washington State, allowing him to trap and band raptors. He directs two long-term studies of urban raptors in the Seattle area, on Cooper’s Hawks and Peregrine Falcons. Ed presents the results of our long-term Cooper’s Hawks study to community groups and university classes throughout Washington State. He is the lead author of a 2017 publication in The Journal of Raptor Research on Cooper’s Hawk behavior and is a coauthor on the chapter on urban-nesting Peregrine Falcons in the forthcoming book Urban Raptors (Island Press, June 2018).